Reflexiones d(en ingles) e Alexis (voluntario del Cuerpo de Paz) desde el techo de Guanaba.Net – editado desde un texto que el escribio para su responsable en el CdP …..
“I stand on the roof of our telecenter every day, smoking the cigarettes I can€™t get rid of, and look out at the town €“ a few thousand people sitting under rust-red tin roofs clustered in an hoyo surrounded by mountain, with little working connection to an outside economy and little desire to have it any other way. Taking it in, I usually can€™t but focus on one thought: this community is completely unsustainable. I suppose I could see this €œcomfortable-scraping-by€ continuing indefinitely, but the youth €“ receiving a more extensive education and being exposed to the outside world far more than even one generation prior €“ do not want to continue the work of their parents. Harvesting a family plot of coffee once a year does not provide enough to produce the life they want. Facing a lack of viable employment opportunities, they leave. And who could blame them? Success has come to mean €œgetting out.€ And the future of this community €“ like so many others €“ is being left to the least educated and least motivated. Looking out at this, I oftentimes think the most practical course of action is a phased evacuation; at least then we could exert some control over the tides of history, minimize the damage that seems inevitable. But Vicky and Yacine have a vision. They see a community that converts its crops into marmalades, liqueurs, packages of dried fruit, and works of art, the entire enterprise €“ from cultivation to processing to packaging and distribution €“ managed by a communitarian small business, selling products at many folds higher than they€™re worth raw, instead of watching them fall from a plant and rot on the ground, as is the status quo. Given the dramatic and diverse environment of the municipality and the richness of a traditional culture threatened with extinction, they see an incredible opportunity to tap into the newly forming and ever-growing market of ecotourists €“ a plan detailed enough to envision agricultural excursions into the loma, yola trips with local fishermen, the larimar experience from mine to necklace, and performances of perico ripiao, and flexible enough to allow for the immersive experience of staying with a Dominican family as well as lodging in a locally owned and run hotel-restaurant. In demonstrating that the land and culture here has a tangible value €“ that people are willing to pay to experience €“ they might even manage to protect a fragile environment and renew a dying culture. My project partners also realize the importance of incorporating these processes within a modern framework, integrating information and communication technologies into projects through €œcursos con sentido,€ which not only offer lessons in the operation of a computer and its basic programs, but also how the computer can be used as a tool to run a small business or manage the workings of an organization. All the while, the telecenter housing these technologies also serves as a core for education, community planning, and more. The connectivity of the internet now allows humans beings to produce meaningful work and earn a substantial living anywhere there€™s access to this global network; teaching jovenes to design web pages and advanced graphics might prove profitable enough and interesting enough to impel them to stay €“ an equally revolutionary project they deem €œtele-trabajo.€ Vicky and Yacine imagine a society that can live in spite of our modern world of consumption and not merely on account of it, appropriating our technology to thrive outside of it, instead of being consumed by the need to consume the products of that technology. This is not some neo-leftist idle dream, but a plan in action with 3 years of accomplishments. Over this period, my project partners have amassed a group of community leaders that consistently comes together every time a meeting or a taller is called; in some of the more astute community members, they€™ve even succeeded in imparting that faith of theirs €“ that what€™s coming could be great, if they work hard enough for it. 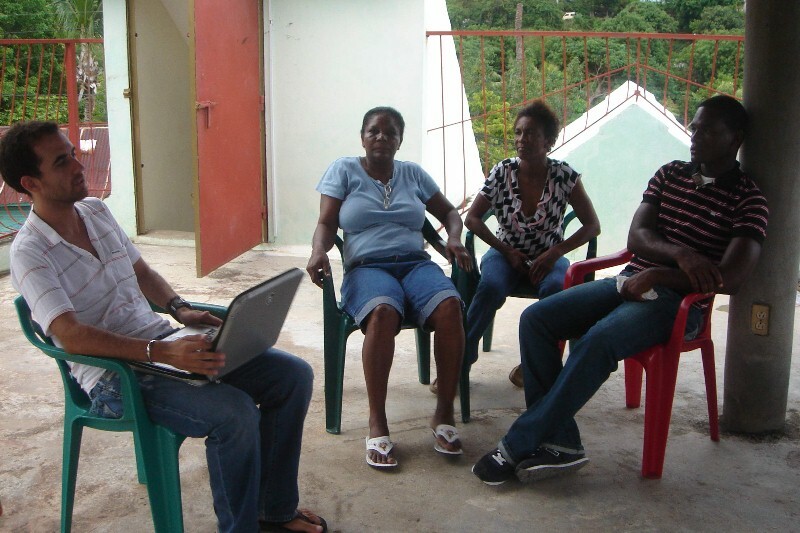 They have trained and guided three jovenes to serve as a telecenter team, who self-sufficiently manage daily operations and work together to resolve problems when they arise, instead of always expecting help from above; now they each also serve as instructors in the group-specific, practical courses the center offers. As responsible as these jovenes may be, their dedication is a direct result of the continued insistence that they are not mere employees but a critical piece of something grander €“ Infomediadores, they€™re called. With the agricultural transformation project, my project partners have organized and effectively outsourced such varied talleres as €œPerceptions of Gender€ and €œBiodiversity;€ the most recent ones have community members working with professionals to establish the statutes that will govern their small business and exploring the process by which to acquire legal recognition as a cooperative. They have negotiated with the internationally certified technical training organization INFOTEP to serve the projects by sending instructors from Barahona to teach months-long courses in accounting and organic agriculture€“ even managing to fulfill INFOTEP€™s requirement of a 25 student minimum, and that despite INFOTEP€™s educational minimums as strict as 2nd year bachillerato aprovado. In the midst of managing these projects, they have just completed a six-month project in four months that sought to link community information and global positioning coordinates with the purpose of producing digital maps: utilizing the labor of community members, they oversaw a census of the entire community and lifted enough data to generate maps on 53 variables as diverse as income generation, structure of residence, locations of trash piles, and incidences of the most common diseases from dengue to worms; they brought these same community members into the computer lab to generate and manipulate the maps themselves, using a computer program so specialized it required instruction by a cartographer from ONE; and they included the participation of local government by mounting a taller on community planning in the ayuntamiento, led by one of Participacion Ciudadana€™s foremost experts on the subject €“ even getting the sindico to sign a contract of cooperation in which he agrees to use the maps for future planning. And now, a sindico who at first wanted very little to do with my project partners, is soliciting their help in putting together the participatory budget recently required by law. Listening to Vicky or Yacine speak about Taigüey€™s plans and actions, it quickly becomes evident that this project is professionally planned and professionally executed €“ but it€™s also matched by an enormous, all-volunteer effort on their part that mostly goes unseen. Here in La Ciénaga, a project of the most ambitious order is met not only with the intelligence but also the passion required to create the radically different reality it strives for. All of it still seems to me like a long shot, but a well-played and a hard-fought one that deserves as much help as is available.